I am sorry I didn’t get a chance to post yesterday!! My day was CRAZYYYYY, as was today, I don’t know how I have time to sit down and do this! It kind of makes me feel like I am forgetting to do something else…. 😡 hummm. haha OH WELL!! How about we start off with Day 5. 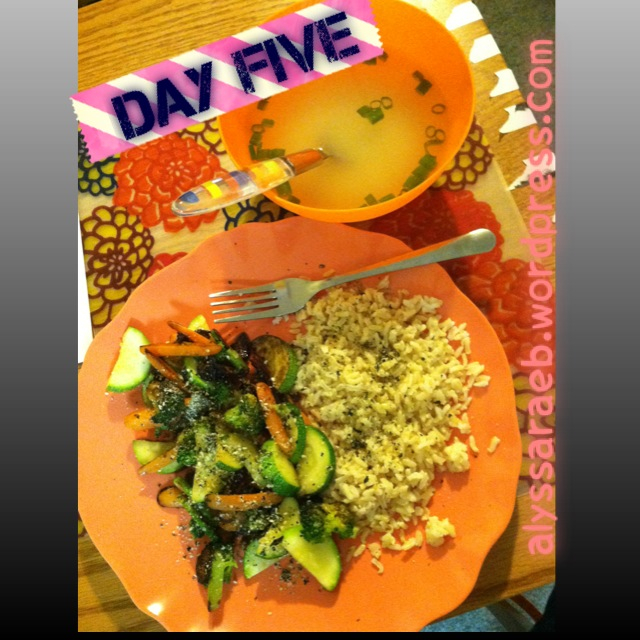 Day 5 was yesterday, Feb. 5th, 2013. It was a Tuesday and I was SUPER BUSY! I woke up and noticed my leg muscles were a little sore and tight. I did a little stretching and felt good as new!! I then made breakfast. Okay, breakfast was AMAZING!! I seriously found a new favorite food/recipe. 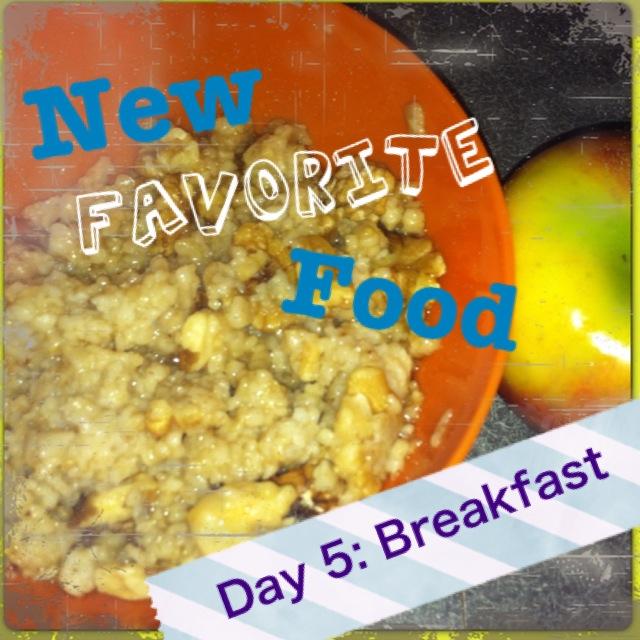 So simple too, oatmeal, walnuts, and maple syrup!!! ( and a serving of fruit!!) I ate that and packed my lunch since I only had an hour lunch break I wasn’t going to spend 40 mins of it walking back and forth to campus! So then I walked up to my first class, Intermediate Digital Art, where class was from 9:30-12:00. I took my supplements around 11:30-11:45 so that by the time class was over and I got to a place to eat I would be able to eat!! I was to take a little side note, just to get everyone ready!! I have an AWESOME project I am working on in my digital art class. I am making a self portrait out of text! YAYA! So excited!! Okay, so anyway, back to the reset! Class was over and a left a little after noon. I went to one of the dining places on campus and grabbed a fork!! I picked a table with a nice view of the FREEZING, COLD outside and enjoyed my lunch! 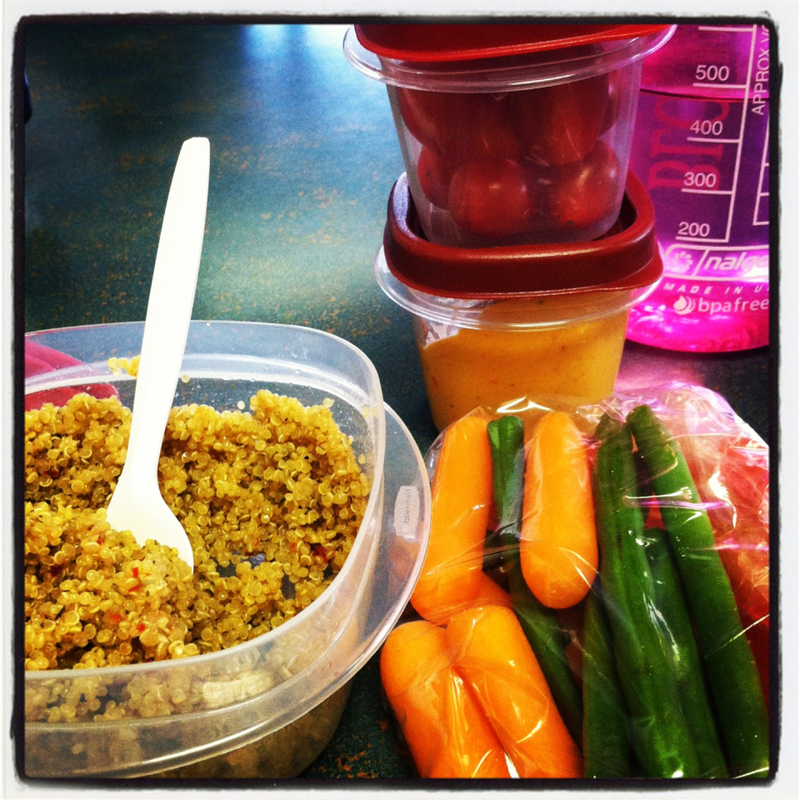 I had quinoa, veggies and hummus!! I finished my lunch and still had a little time to spare. I posted this beautiful picture on Instagram (follow me: alyssaraeb) and just relaxed and let my food digest. Soon enough it was time to go to my painting class. Then back home, I think I had a snack yesterday, saltines possibly, ( I can’t remember :x) hahha! Then I was making dinner, which was also FABULOUS!!!! After dinner I had A LOT of homework to do! i went to bed way later than I wanted to! I was just getting tired and cracky. That of course had nothing to do with the detox, I go to bed early ALWAYS, or else I get a little cranky haha. As soon as my head hit the pillow, I was OUT!! So little things I picked up on throughout the day, that may or may not be related to the detox. First I noticed I am breaking out on my chin. This could be because of the reset, or because since I am a girl we have our “friend” come once a month, so it of course could be that. YAY for perfect timing (-__-) Then my sore muscles I mentioned earlier. I think that is from the detox, I know we are not recommended to exercise while doing the Ultimate Reset, and even though I do not intentionally exercise, my campus is on a hill, I live on the 3rd floor of an apartment building ( always take the stairs of course –we don’t have an elevator anyway! haha), and all my classed are on the 2nd or 3rd floor of their buildings. So, it is almost like going to the gym and spending some time on the StairMaster :p Other than basically those two things, I haven’t noticed anything else. So today was the real day 6. Today was crazier than yesterday. I don’t have too too much to talk about for the reset today besides food! I had the same thing for breakfast today as I did yesterday. That is not what it class for, but I did not have one of the main portions of today’s breakfast. For lunch I had some left over quinoa and a micro salad. i worked crazy on school work in between my two classed and only took a break to eat my lunch. 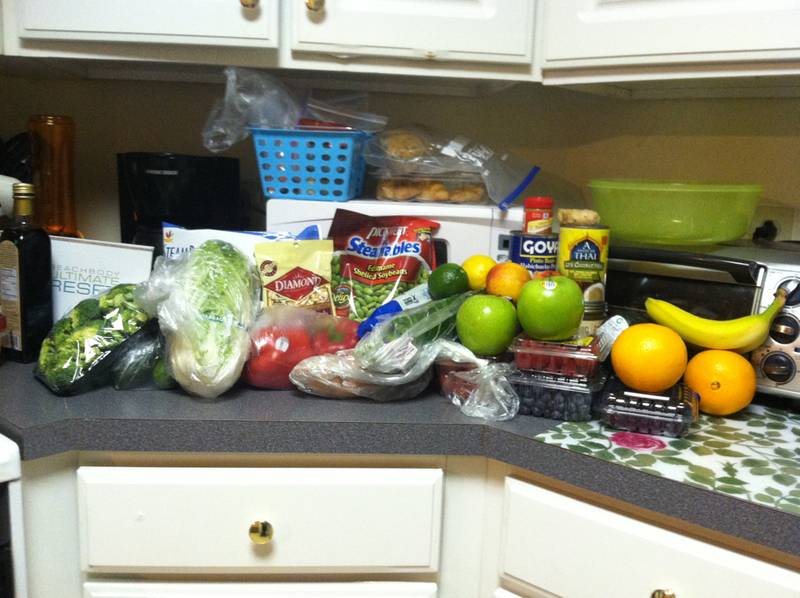 I came home and went grocery shopping for Week TWO!! I think everything I bought was a fruit or a vegetable!! Well I did have a spice and some coconut milk haha! But still, I can eat for a whole week off of JUST fruits and vegetables alone! This is so crazy! People think they need to buy pounds and pounds of meat per week to feed their families. Right here is all you need for a perfectly balanced diet! So yummy and satisfying too! After I put everything away I decided I would make dinner. I am so glad that I was not STARVING! Because I did not have tonight’s dinner prepared yet. Of course it was the ONLY meal so far that has a decent amount of prep work that had to be done. It wasn’t too bad, I just was ready to relax! … and I couldn’t. So I started to make a few of the ingredients and parts that needed time to cook or soak. As that was going on I decided to shower and do a few other things for some me time. Like clean up my bedroom and gather stuff for tomorrow. Dinner tonight was interesting. 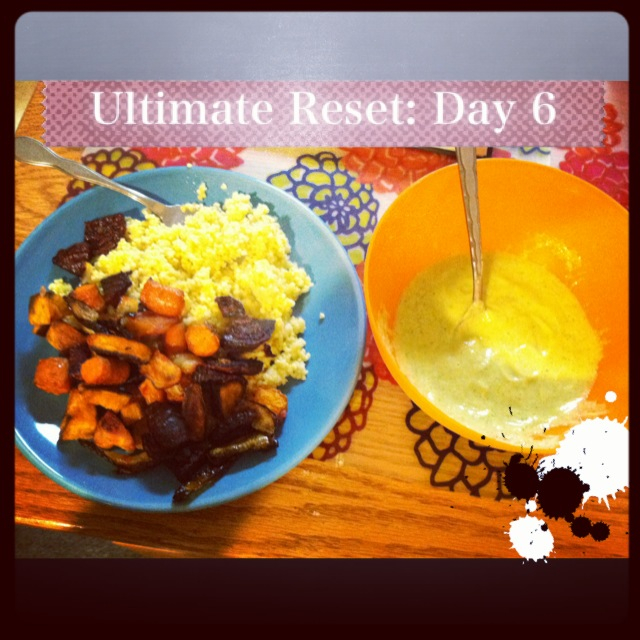 I had some Zucchini and Cashew Soup, Millet something…, and Roasted Beet Medley( or something like that!) Everything was good. The soup was reallly good!! I over cooked the Roasted Medley concoction, so that was a little burnt, otherwise really good. The Millet was .. different. I don’t think I cooked it long enough, it was a little hard; or maybe just harder than I expected it to be. New Year, New You! January 2015 for the Win!